Working with cross-grain material is a bit of an uncomfortable concept for most woodworkers. We learn from the start that wood has practically all its strength and stability along the grain, while across the grain i's weaker, prone to splitting and to dimensional changes with the seasons. Purposely cutting wood into strips with the grain running across its narrowest axis just feels wrong. However, the cross-grain woods we're looking at here are applied decorations. They have no structural role and the only strength requirement is to stay in place without deforming. 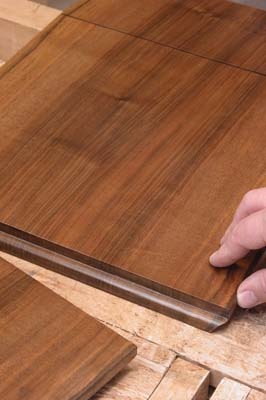 In the same way as veneering, cross-grained material is fixed with a large adhesive area. This means the pressure and tension created by seasonal movement is distributed evenly rather than creating stress at one point. 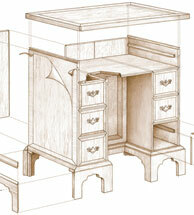 Animal-based woodworking glues are excellent for this work because they soak into end-grain when applied. They provide the initial grab and flexibility to pull cross-grain decoration in place while it dries and shrinks, then they set, holding every fibre along the whole length solidly in place. 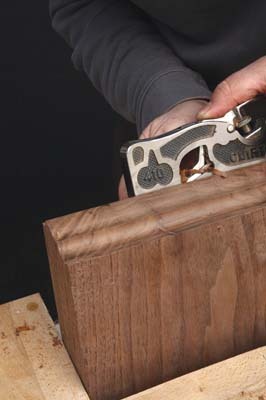 Walnut has a unique character - it cuts crisply and is easily worked with sharp tools. It's fine-grained, holding detailed shapes and it has a rich variety of subtle colour tones. European walnut shows a range of browns, mauves and greys banded through the same piece of wood and this feature is revealed in sections when it's cut across the grain. Cross-grained decorative details exploiting this property were applied to fine quality furniture in the late 1600s and early 1700s. This is when European walnut was still the material of choice and before its role was replaced by tropical mahogany with its uniform colouring. American walnut is more limited in the range of colours but its grain detail can be stronger. Contemporary furniture makers, who employ walnut for its fine qualities as well as its sustainable sourcing, may also have some ideas about its cross-grained possibilities. A bearing guided router is ideal to prepare simple quarter-rounded beading. Before shaping the beading, select a suitable board of walnut that has varied colouration running through. Plane and thickness in the normal way then crosscut the end with a saw. The router cutter bearing needs a perfectly smooth, flat edge to run against and the sawn end of a board is not level enough. The sawn ends of fibres would produce ripples in the surface of the beading. 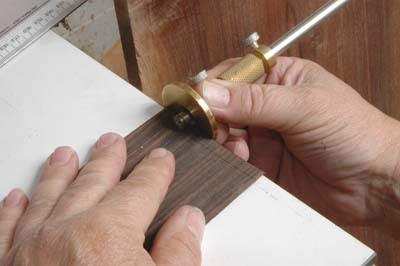 A hand-planed piece of MDF is clamped beneath the walnut allowing the cutter to form a full depth quadrant. 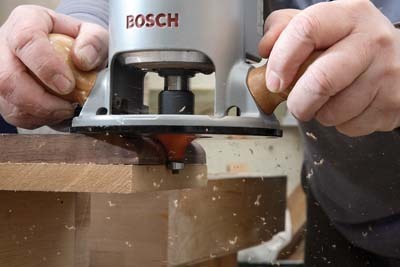 If you recess the MDF very slightly then, when the bearing falls below the walnut on the final pass, the cutter will make a clean, full depth cut. Cross-grained beading is applied as a series of short lengths. Each piece of beading is formed on the end of a board and then sawn off as a strip. I use the bandsaw with a crosscut fence for this because it's slower, finer and more controllable than a circular saw. 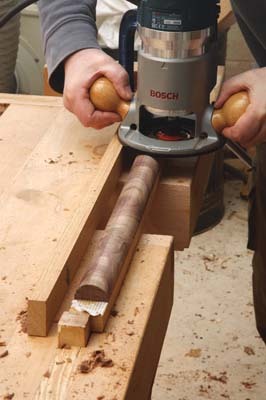 The order of the strips and matching of joints between them can be a key feature in the success of cross-grain beading. If the wood is crown-cut, or not perfectly quarter-sawn, then the ring directions may be alternated to csreate a continuous wave pattern. Rehearse how the sections of beading will fit together and mark them before mitring the ends and fitting them to furniture. 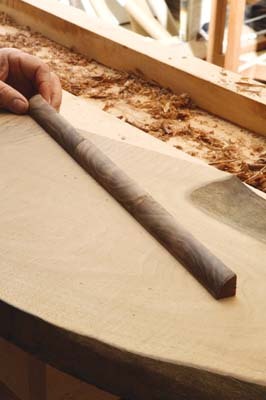 To create a wider beading, or a double sided one such as the half-round shown here, the cross-cut wood needs to be attached to a temporary backing strip. Again, MDF is the ideal material for this because its hand-planed edge will also provide a guide surface for the bearing guided router to run against. Ordinary PVA glue is fine for this temporary attachment between walnut and MDF. It has the advantage that, in a warm workshop, it will set to full strength in a few hours without risk of detaching under vibration from the router. However, it's important that you're able to remove the finished beading without risk of splintering the underside. A layer of paper in between will allow you to split the beading from the backing after the profile is cut, and then plane any paper and glue residue from the beading. 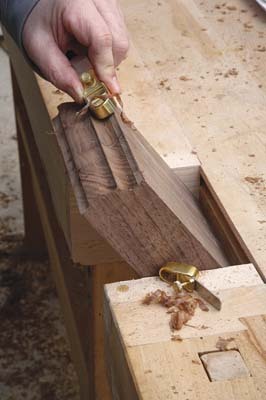 Hand planes are of course the traditional tools for shaping mouldings. Nowadays they come into their own creating more complex profiles that can be cut away in stages from a series of simple straight and curved sections. When the plane's cutting edge is sharp and finely set it leaves an almost polished finish. Cross-grain beading can hold surprisingly detailed features. In many cases these can be much sharper than profiles running along the grain, which are prone to splintering. There's always a need to be aware of the grain direction when shaping a feature into a moulding. Features that leave very short grain unsupported are likely to break off and must be avoided. However, where the design detail ensures that the cross-grain runs out into a sharp edge it can be very durable. Even if the wood is accidentally bruised, the fibres will not be detached in the way long-grain might be. Animal glues, known variously as pearl glue, Scotch glue, hide glue etc have been used by furniture makers for millennia. They were used to fix original cross-grained walnut beading in the seventeenth century. 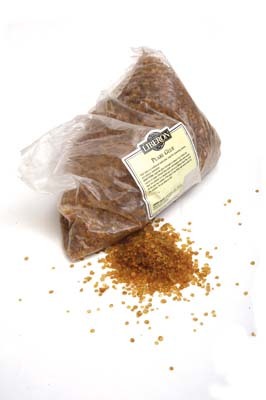 Pearl glue is the most readily obtainable form of the traditional animal glue available today. It's formed from dried 'pearls' of the prepared glue mixture and it needs to be re-hydrated by soaking in cold water overnight. After removing all surplus water, I recommend adding fresh water in the proportion of twice the original dry weight. 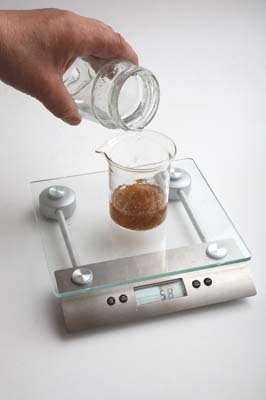 Before it can be used the glue mixture must be heated to around 60ÂºC, stirring frequently until there are no lumps. Thermostatically controlled electric heaters are available for this at a price but they are not economic for occasional use. 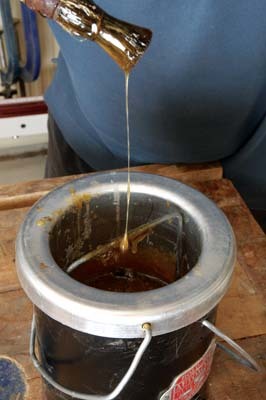 A simpler method is to stand a pan of glue in a larger pan of water, which is just kept simmering. 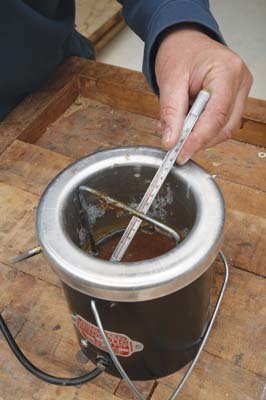 The exact temperature this produces depends on a number of factors, in particular the pan sizes, but this method will always keep the glue well below boiling point which is important to stop it breaking down. Use a natural bristle brush to apply the glue (such as a cheap brush sold for children's art) - artificial fibres will not take the heat. As a hot mixture the pearl glue is liquid and runs freely off the brush, but within a few tens of seconds it starts to gel and if it's trapped between two surfaces it will grab them together. Testing a drop of glue between finger and thumb you can feel the grab starting to work. 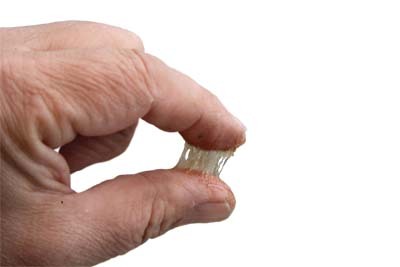 The gel stiffens over a period of hours and then starts to harden, eventually becoming extremely tough and hard. While you're working on a job, the mixture in the glue pot can be kept warm for several hours but it will need frequent stirring and topping up with hot water of the same temperature. Hide glue washes off your hands and brushes with hot water, even when it has fully set. 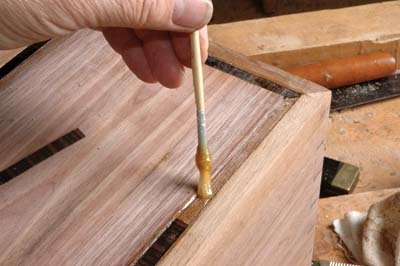 This is another valuable feature when making joints with hide glue - it gives you a second chance. A more familiar form of applied cross-grain decoration today is banding. This is cut as thin strips, again with the grain running across the narrow axis. Walnut and other woods with linear figuring are suitable. The material can be commercially produced veneer or else custom-made veneer cut on the bandsaw from blocks of well-figured wood. I use a cutting gauge to produce strips of well-regulated width. 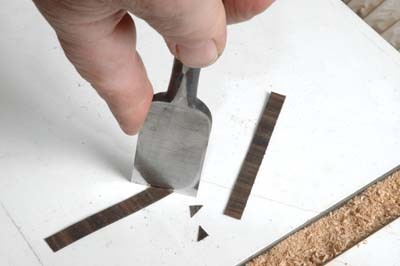 Lay the veneer on the edge of a flat surface so the end of the veneer exactly meets the edge. 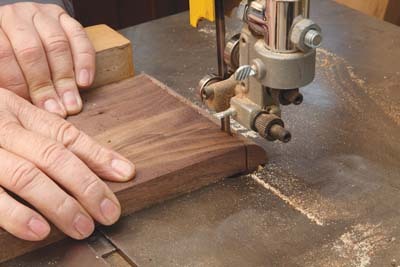 Use the cutting gauge to scribe across the veneer in a series of shallow strokes until a narrow band is detached. Chop the corners off the banding with mitres at 45Âº, using a sharp, wide chisel so they will meet together to form a perfect right angle. cutting a slot in it. The width of the slot must exactly correspond to the width of the banding and the depth of the slot must be the same as the banding thickness. Brush pearl glue generously into the slot then quickly apply the banding before the glue has a chance to cool. 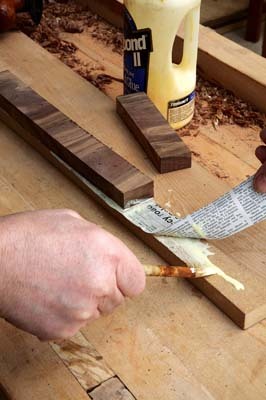 Push the banding into the bed of hot glue, ideally using a veneer hammer. This tool is not intended for hammering but for pressing veneers onto a surface. However, its shape is similar to a cross-pein hammer, hence the name. Alternatively you might use the back of a real cross-pein hammer. Excess glue can be wiped off the surface with a warm damp rag. 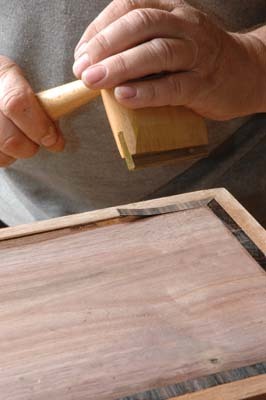 Once the glue has set but before it hardens the surface is flattened using the edge of a cabinet scraper blade. I hope this article has given you some food for thought on using cross-grained wood techniques in your furniture making project. Gluing contrasting veneers onto a surface to provide decoration was not a new idea at the end of the 17th century but it was new for it to become frequent practice. This was probably the result of the influx of European craftsmen and the arrival of a Dutch royal family in England. 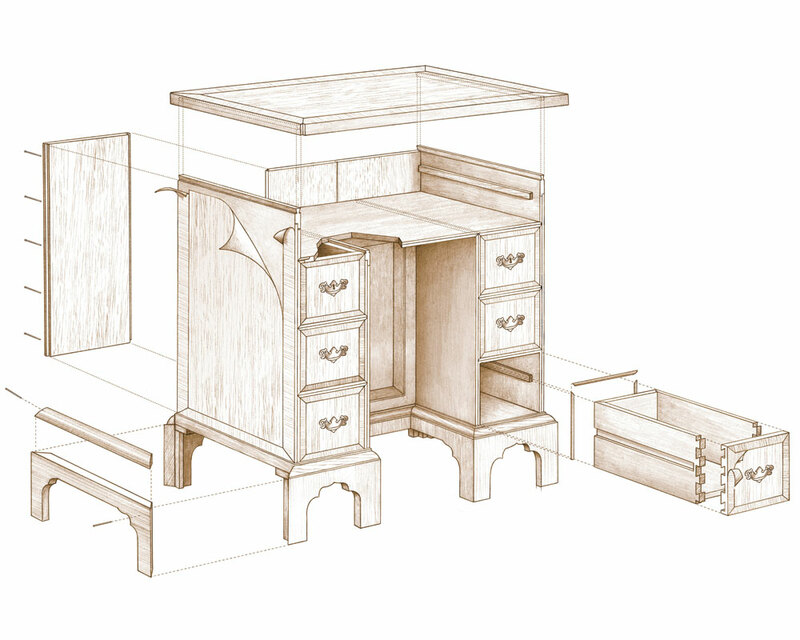 Whatever the cause, English furniture gained cross-grained mouldings and cross-banding which heralded the Georgian furniture styles. What makes cross-grain work so distinctive is that the natural figure of the timber used was, almost literally, turned on its head. The appearance of an apparently solid wood surface, looking like no wood ever did before in real life must have been most dramatic. One can imagine people going up to the item, peering at it and touching the veneers with their fingers to try and work out how the timber had been used.